Lots of really amazing produce items for you this week. Melons, tomatoes, greens, roots, avocados, and some wonderful citrus. So good. Put your water wings on and dive in. Not sure that there is anything more satisfying than planting on a beautiful spring day. People are itching to finally break their winter dormancy and get on outside. Nurseries are full. And folks are optimistic about having a gorgeous garden this year. 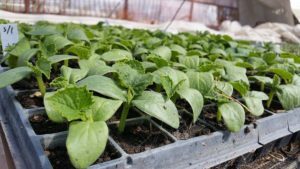 Well, let me take this newsletter to help with some planting advice so that you can make that optimism a reality. First off, your soil. Don’t over-think this. I feel like too many times gardeners (and farmers) act like they are making a bed for royalty when prepping their garden beds. You do Not need to fluff the soil, break every dirt clod into a fine powder, and add 4 inches of well composted bat crap. You can do all of those things, but please realize that you are doing that more for yourself than you are for the plants. I hate to break it to you, but plants really don’t need all of this TLC that we give them. They have been around for ages and will be around for ages whether we spritz them with compost tea or not. Mother Nature will find a way for Her baby plants to live, so don’t psych yourself out when it comes to growing. Plant roots are extremely capable of breaking up what seems like poor looking soils. So with that said, spare yourself the back-breaking task of renting a tiller and beating up your soil into a fine powder. Just clear any weeds or plant debris from where you want to plant, dig a small hole, and put your baby transplant in the ground. Even if the ground is to hard to dig (which I had at my casa) soak the spot the night before with a hose, and the next morning you will have an easy time digging a hole. Do not spend a lot of time “amending” the hole where you are planting. Many nurseries will tell you to dig a hole twice as wide and twice as deep as the pot, mix in a bunch of stuff, then plant. Don’t do it. This can make the plant have Too nice of an environment and then when the roots hit the natural soil, it can shock them and make the plant become root-bound. Just open up the soil enough to bury the root ball and you are in business. Quick and easy. Buying the right plant. When you are looking for a plant, grab one that looks good and remove the plant from the container. Look at the roots. You ideally want the roots to be holding onto the soil, but not so many roots that they are crowded. I always like to pinch or cut the bottom of the roots off so that they are ready and in position to grow down. 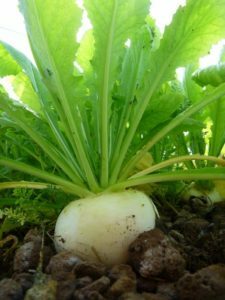 This will not hurt the plant and actually creates a really clean root to soil contact between the roots and the native soil in your garden. Second thing (and more importantly) when selecting a plant, size does not matter. A little 4” pot will catch up to a gallon pot in a few weeks. When it comes to veggie plants, never ever buy gallon plants. They have been living in a container for too long and usually completely stressed out. 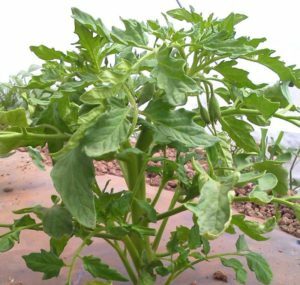 When you see a tomato or tomato flower on a plant, that means the plant is stressed and not healthy. Why? Tomatoes, peppers, etc are fruit. A fruit (seeds) is the plant’s attempt to procreate. And the only way to get a baby plant to produce a fruit or flower is to make it think it is going to die (stress it). So when you see a baby tomato plant at the nursery and it has flowers or a small tomato on it, that plant has been stressed out and is trying to reproduce. And once you stress a baby plant, you might as well compost it because it will never produce as an adult. So look for those bushy/stocky plants with no fruit or flowers on them. You’ll thank me. Fertilizers and Irrigation. You have to fertilize your garden or all you are doing is mining your soil. Each harvest you make, you are essentially exporting nutrients away from your garden. Those nutrients and minerals Have to be replaced. Compost is great, but it honestly doesn’t give your soil everything it needs to be healthy. So we use a diluted fish emulsion fertilizer (like 3 tablespoons per gallon) that we soak in the roots every few weeks. You don’t need a lot, but you need to have a good routine of feeding your soil. Lastly watering. Here is a good rule of thumb for a plant: Whatever you see above ground, the plant produces below ground in roots. So a baby plant has a baby root system and you will need to water more than a larger plant. Always try and water past the size of the roots though so the roots have “incentive” to continue to grow deeper. This will help with many things but also make them more drought tolerant.